Stock car novels. Dirt track racing. Auto racing fiction for teens. It’s a sizzling summer Saturday night for dirt track auto racing. Headwaters Speedway is the place to be. 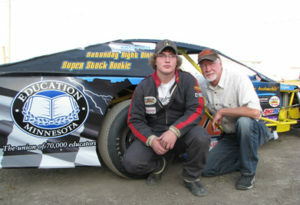 Thanks to rainouts across the state, this small-town dirt track draws big-time stock car teams and lots of local drivers. Trace Bonham’s Street Stock Chevy is acting up in a big way. Beau Kim’s “stone soup” Modified has been patched together from whatever parts he could scrape up. Amber Jenkins, a strawberry blonde who drives a Mod-Four, has what it takes to drive rings around everyone. And keeping everyone on track is Melody Walters. She knows that the impending rain might be exactly what’s needed to keep her father’s speedway afloat—or sink it for good. Thunders booms on and off the track in this first novel in the MOTOR Series from FSG, New York. “Thoroughly enjoyable…this book presents a fascinating look at small-time racing where the love of it gives the glitz of NASCAR its roots.”—School Library Journal. “Compelling…It is the atmosphere of the track that is the real star here. Young racing fans, particularly those familiar with the small tracks that dot rural parts of the country, will find much that rings true.”—Booklist. “Librarians need to steer boys who tinker with internal combustion engines to Weaver’s latest work. Short chapters and a brisk pace…may attract those reluctant readers who can recite the firing order of a V-8 and know how to tighten down a valve cover.”—Kirkus Reviews. Trace Bonham was looking for a wrench. He yanked open a drawer on the big rolling toolbox. All hammers and screwdrivers. “Come on kid, bottom drawer left side,” barked Larry Rawlins. Larry was the unofficial crew chief on the Bonham Farms yellow No. 32 Street Stock. The was dirt track auto racing, and Larry was bent over the engine compartment. Freshened cylinder heads on the 350 -cubic-inch Chevrolet block were finally in place. Maybe tonight the Chevy would finally run right. Unless Larry was sabotaging Trace. There was something about the guy, hired by Trace’s dad, that was creepy and untrustworthy. Saturday Night Dirt was written for motorheads who love cars and are not wild about English classes. Dirt track auto racing books are hard to find! It was also written for the teachers and librarians on the look-out for good books for teens–ones kids will actually read. Writing Saturday Night Dirt was a lot of fun, too. It allowed me to get my own motorhead back on. As a teenager I was all about drag racing, smoking tires, hot summer nights, and dirt track racing. However, then came college where my life took a turn for the literary. A career of teaching kept me away from cars, speedways, and high rpm, but now it feels good to reclaim that important part of my life. In order to write a good short track auto racing novel, I formed my own race team. In the photo above is the Team Weaver “Book Mobile.” We race in the Midwest Modified Class. Beside me is my driver, Skyler Smith. This is first book in the series of three Motor Novels. 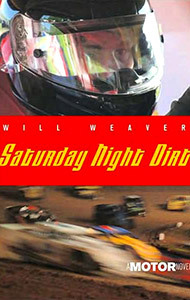 Fun fact: while Saturday Night Dirt is auto racing fiction, that’s Skyler on the book cover. He thought that was super cool.